We are a pasta family. We love pasta...in all shapes and forms. I am also prefer vegetarian meals and love to create side dishes or main dishes that can satisfy meat-lovers and vegetarians alike! 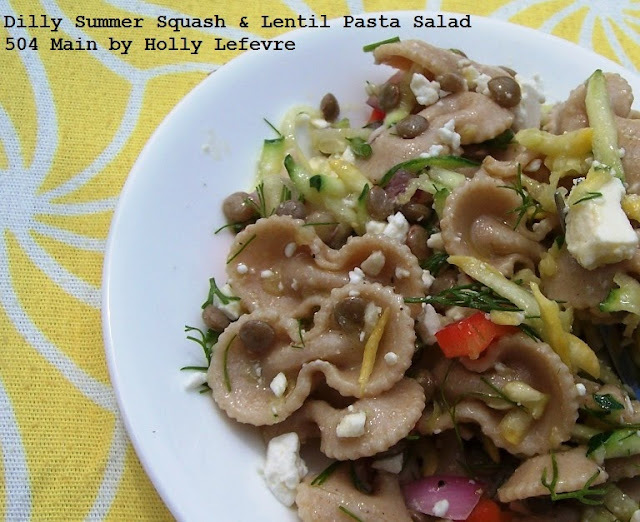 I created the Dilly Summer Squash and Lentil Pasta Salad to be served in smaller portions as a side dish but also it is hearty enough (thanks to the lentils) to serve as a main dish! 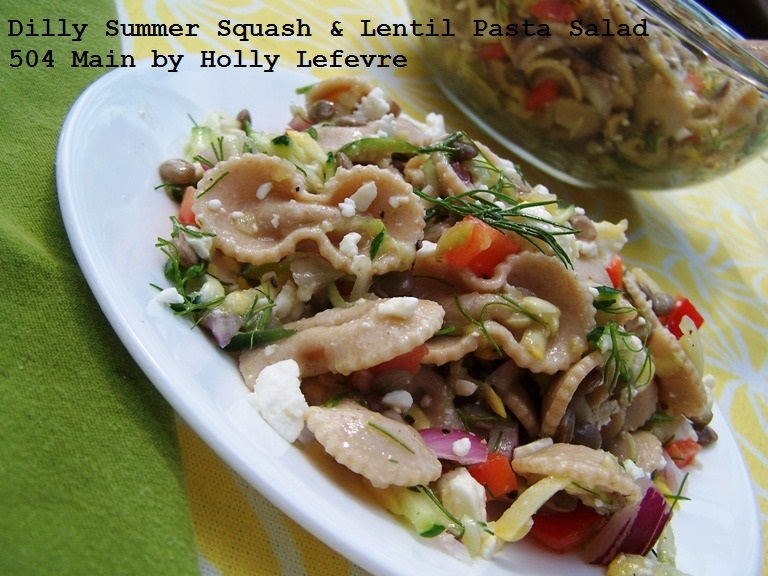 It is full of fresh summer flavors and has already been a hit at a few of my summer parties! Prepare pasta according to package directions: Bring 4 qts. of water to a boil. Salt to taste. Add pasta to boiling water; stir vigorously until water boils again. Cook for 7-9 minutes or until desired tenderness. Drain. Prepare lentils: At least 8 hours prior (or overnight), soak 1/2 cup DRY lentils in 2 cups water. Drain water. Using a steamer basket, fill large pot with a couple inches of water. Place steamer basket in the pot, add the lentils to the basket, cover and steam for approximately 20 minutes. Taste the lentils at this point to see if they are the desired tenderness for you. Once cooked, let cool. Prepare dressing: Place 1/3 cup olive oil the juice of 2 lemons, 3 cloves of garlic (minced), 1 tsp ground black pepper and 1 tsp salt in a jar or container and mix together. Let pasta and lentils cool. Using a basic cheese grater (mine has large holes on one side and small on the other. I used the larger holes) grate the yellow squash and the zucchini. Add to the bowl. Slice the red onion in half. Save one half and and coarsely chop the other half. Add to bowl. Coarsely chop the red pepper. Add to bowl. Wash and pat dry the dill. Chop the dill leaves (trying to avoid using the stem). Set aside. The large bowl should have the 2 varieties of squash, red onion, and red pepper. Once the lentils are cool add them to the vegetable mixture. Once the past is cool add it to the bowl. Pour dressing over the salad and gently mix to thoroughly coat the salad (you can adjust the amount of dressing, by adding a little at a time). Add 1 cup of crumbled feta cheese and toss. Add the chopped dill, mix to combine. This might seem like a lot of ingredients...but it is really easy to prepare and all of the ingredients are easily available in most markets. And it tastes so good...you will want to make this again and again! Have you tried Hodgson Mill Whole Wheat Pasta? ENTER to win a $25 Hodgson Mill Pasta Prize Package right now! Leave a comment telling me which Hodgson Mill Whole Wheat Pasta you want to try. That is it - super simple! This post is written and created at 504 Main by Holly Lefevre disclosure: Hodgson Mill sent me a selection of pastas to create a Summer Pastabilities recipe for their contest. All opinions and recipes are my own creation. I love pasta too, Holly, and this dish really looks delicious. This one is going on Pinterest recipes! I would love to try their Whole Wheat Fettuccine and make chicken alfredo! I like to try the whole wheat bow ties--never had them in whole wheat. 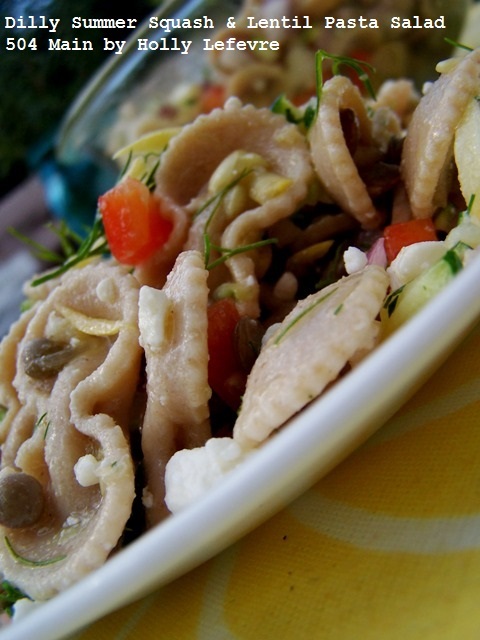 Oh I would love to try the Whole Wheat Bow Tie pasta! I like the Bowie because we pretend they are butterflies. I love wheat pasta, it's all we use. That being said, I'd like to try the Angel Hair pasta. We use that for nearly everything, spaghetti, alfredos, etc. I want to try the Whole Wheat Spirals. I would love to try the Bow Tie. I would like to try the lasagna! I would love to try the whole wheat Mac and cheese. We love angel hair pasta so that would be fun to try in a whole wheat version. I would love to try their angel hair pasta. I love using that pasta in pasta salad. I love the way you added dill. I bet that tastes so good. I have some fresh basil and I think I'm going to add that into the next pasta salad I make. I'd love to try the medium shells! I would like to try the shells. I would like to try the Whole Wheat Egg Noodles, I bet they'd make a great beef Stroganoff. I'd like ti try their Whole Wheat Lasagna. I would like to try the whole wheat pasta - I have the perfect recipe for it! The bow tie pasta would be so fun, but I'd also love to try the Macaroni noodles too! I'd love to try the penne whole wheat pasta...I would use it to make fettucine alfredo. I would love to try the whole wheat egg noodles to make some chicken noodle soup! I want to try the mac and cheese! The egg noodles sound interesting!! id like the whole wheat elbows. i would like to try the Veggie Rotini Spirals (4 Natural Flavors)-16oz. I would like to try the Angel Hair pasta. I would like to try the fettuccine. We eat a lot of pasta. I would love to try the angel hair the most. That pasta dish looks so yummy! I'd like to try the medium shells or the spirals. I like any shape other than plain old spaghetti. I WOULD LIKE TO TRY THE Whole Wheat Fettuccine. I would love to try the Whole Wheat Spinach Spaghetti. Yum! kristiedonelson(at)gmail(dot)com Thank you. Liked on Pinterest. Kristie Donelson. I'd like to have the Egg Noodles around the house. There are just so many things you can make with egg noodles! I am most interested in the Whole Wheat Macaroni and Cheese. We primarily use pasta in casseroles, but the kids love macaroni and cheese. def the WW mac n cheese! I follow Hodgson Mill on pinterest under straykattt!!! Whole wheat mac & cheese ... I'm such a sucker for mac & cheese. I would love to try the whole wheat mac and cheese! What a great way to feel like a kid again but with nutrition! Whole Wheat Penne looks fabulous. I love Penne! I want to try whole wheat egg noodles! I'd love to try the Whole Wheat Egg Noodles. I love to cook with egg noodles! I would like to try the whole wheat elbows, our favorite around here. I'd like to try the Whole Wheat Spirals. I would really like to try the whole wheat penne pasta. As a college student living alone, and on an extremely budgeted income- I know 25.00 in pasta could go a long way towards keeping my self healthy. I can't wait to try to Fettuccine. Pasta dishes are about the only thing I know how to cook! Karen Delaney (username karengdel) follows Hodgson Mills on Pinterest. Either the spirals or the shells would be great in my homemade soup! I would like to try the whole wheat spirals. I would like to try the whole wheat fettucini and use it to make spaghetti. I'd love to try the whole wheat egg noodles. I'd like to try the Whole Wheat Penne Pasta. I would love to try the penne whole wheat pasta. I would love to win the Whole Wheat Bow Tie Pasta. I would love to try Whole Wheat Elbow Macaroni-16oz. for my soups. I'd like to try the Whole Wheat Spinach Spaghetti-16oz. I like the Whole Wheat Bow Tie! whole wheat mac n cheese! Whole wheat mac n' cheese sounds fabulous :) Thanks for the opportunity! I would love to try the Whole Wheat Macaroni & Cheese!! I would like to try them all but Angel Hair Pasta would be my first to try. I'd try the Whole Wheat Bow Tie Pasta. Bow ties are my favorite. I want the whole wheat bow tie pasta. I have to say I'm not a dill person, but this combo sounds so interesting I just might try the recipe. Looks really great. Best of luck with the contest!